You are here: Home / FEATURED POLITICS / WHAT DID VICE PRESIDENT BIDEN DO IN MEXICO AND HONDURAS? 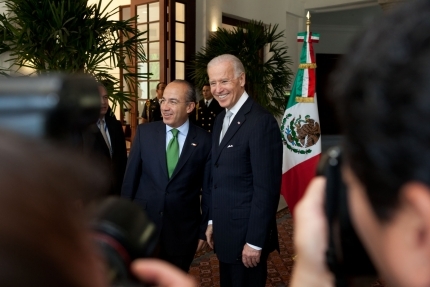 WHAT DID VICE PRESIDENT BIDEN DO IN MEXICO AND HONDURAS? Vice President Biden interviewed with Telemundo, Univisión and CNN en Español this week after returning from a visit to Mexico and Honduras as part of the administration’s sustained, high-level engagement with the Americas. The Vice President’s visit comes in advance of the President’s participation in the Summit of the Americas this April in Colombia, which will focus on leveraging Hemispheric connections and partnerships to improve the lives of people throughout the region. In addition to discussing his visit, the Vice President talked about the DREAM Act, immigration reform, and what it meant to him to visit the Basilica of Our Lady of Guadalupe – one of the most visited Roman Catholic sites in the world and the most holy Roman Catholic site in Mexico. Both Telemundo and Univision will air larger portions of the interview on their Sunday shows Enfoque and Al Punto so tune in, but here are clips of the interviews they have already run. To read more about the Vice President’s trip to Mexico and Honduras Click Here, and for a blog post on his visit to the Basilica of Our Lady of Guadalupe Click Here. See a slideshow of the Vice President’s triphere.